Can Mr Kipling achieve exceedingly good Ad scores? Mr Kipling, which is owned by Premier Foods, has been serving the United Kingdom with tasty delights since it was introduced into the market in May 1967. With its catchy slogan – ‘Exceedingly Good Cakes’ – the baked goods brand has grown to be the largest cake manufacturer in Britain for almost 40 years. After it was revealed that sales had dropped 6.1% in the first six months of 2014, Gavin Darby, chief executive of Premier Foods, announced his plans of doubling marketing spend in the second half of the year. Various factors could be to blame for a drop in sales with consumers ‘healthy living’ being one driver to consider. YouGov recently carried out a ‘food labelling’ study in conjunction with the Chartered Institute of Marketing, which highlighted sugar as a ‘new evil’ for the UK consumer. Over half of the population (58%) claim to look for sugar content on packaging when shopping and it’s also rated as the most important element of nutritional information that consumers currently require. In an attempt to hurdle issues such as this one, Mr Kipling are currently running a new “Life Is #BetterWithCake” advertising campaign, which mainly focuses on a TV advert that was aired on 25 August. The campaign features a little boy and his imaginary pink elephant friend perform a dance before sharing a piece of cake. The ad follows from research by Mr Kipling, revealing that 72% of the nation agreed that cake made life better. Has this campaign managed to put Mr Kipling in the hearts and minds of its consumers? YouGov’s BrandIndex data suggests so. 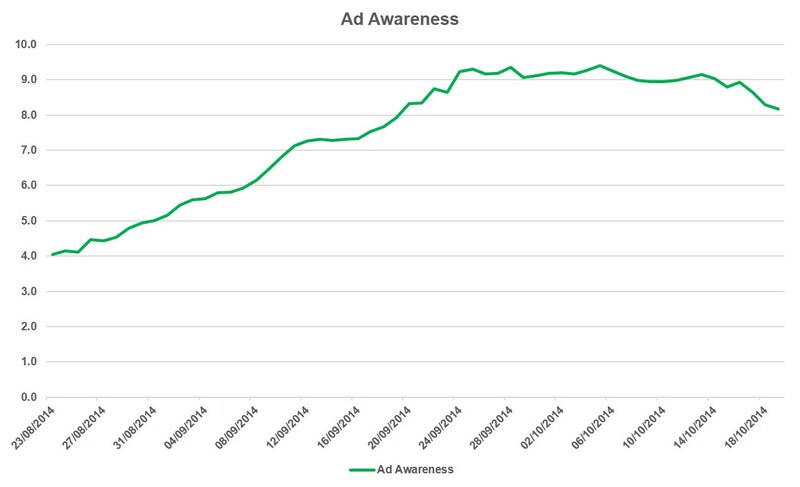 By looking at Mr Kipling’s Ad Awareness metrics, which measures whether respondents have seen an advertisement from the brand in the past two weeks, we can see that the number of those who remember seeing a Mr Kipling’s advert increased after the TV ad launched on 25 August. It’s Ad score started from 4.1% and reached a peak of 9.4% on 5 October (up by 5.3 percentage points), indicating that the creative advert has proven to be memorable for consumers. YouGov’s Purchase Intent metric measures whether respondents are most likely to purchase from a particular brand. Since the ad hit TV screens, its score went up by 1.4 percentage points on 7 October. However, there has been a strong correlation between Mr Kipling’s Ad Awareness and Purchase Intent scores. BrandIndex shows that the Purchase Intent metric started from 9.5%, but reached a peak of 13% on 1 October. Despite the sales drop in the first half of the year, the “Life Is #BetterWithCake” campaign has shown that not only is the brand’s latest advert memorable, it could well be encouraging those who have seen the advert to purchase Mr Kipling’s cakes. Mr Darby’s decision to invest more on their marketing spend may boost their sales by the end of the year.